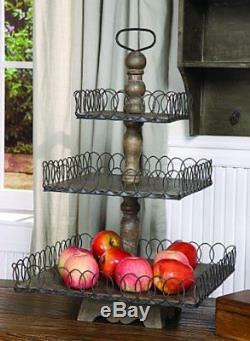 Creative Co-Op Grey Wood 3-Tier Tray. Perfect for holding fruit and veggies in the kitchen Made from wood and wire Measures 16.5" square x 26.75"H. We do not accept P. BOXES -PLEASE PROVIDE A PHYSICAL ADDRESS. We advise you to use a reputable carrier service when returning your goods. We guarantee that your issue will be solved quickly. We usually respond within 24 hours on weekdays. 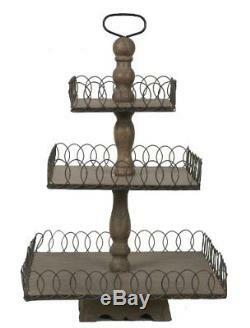 The item "Creative Co-Op Grey Wood 3-Tier Tray" is in sale since Monday, September 04, 2017. This item is in the category "Home & Garden\Kitchen, Dining & Bar\Dinnerware & Serving Dishes\Trays". The seller is "thechange-20" and is located in US.